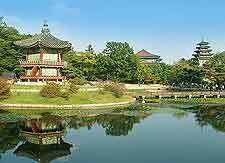 South Korea is home to some exceptional attractions, many of which make for recommended day trips from Seoul. The living museum known as the Korean Folk Village can be found to the south of Seoul, close to Everland, and has become an especially popular attraction and leading day trip destination. Panmunjom is a charming village situated just over 50 km / 31 miles to the north-east of Seoul and on the easterly outskirts of Kaesong, while to the south-east, the relaxing and peaceful attractions within Namhansanseong Provincial Park contrast greatly with busy city life. 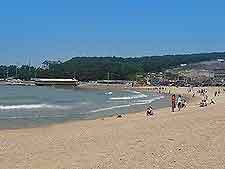 For sun and sand, you will find the beaches on Yeongjong Island rather alluring. Located within the province of Gyeonggi, the Korean Folk Village is the place to come if you wish to experience the traditional culture of South Korea. 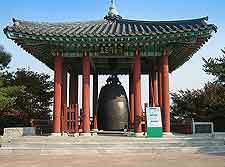 Demonstrations of dancing, wood craving and metalworking are on hand, along with an art gallery, sculpture garden, and both the World Folk Museum and the Korean Folk Museum. Namhansanseong Provincial Park offers the perfect respite and lies to the south-east of Seoul, where it is home to some exceptional ancient fortifications dating as far back as the 17th century. Other attractions around the Namhansanseong Provincial Park include the shrine of Chonggyedang, a series of temples and archaeological remains, and some easy hiking trails with pleasant scenery. Most famous for being the actual spot where the armistice ending the Korean War was signed in 1953, Panmunjom lends itself to day trips. Panmunjom is quite literally full of military-related attractions, with many particular highlights, such as the Camp Bonifas, the Bridge of No Return, the Freedom House, the Peace Pagoda, the Taesong-dong (Freedom Village), and Kijong-dong - the site of the world's tallest flagpole (160 metres / 525 feet). 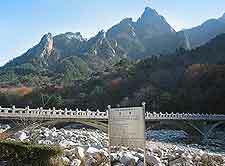 Suraksan is an imposing mountain located on the eastern side of the Bukhansan National Park, where it has become known for its plentiful recreational attractions, such as hiking and climbing. 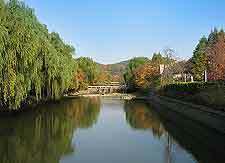 Within easy reach of Seoul, Suraksan is extremely popular and can become very busy at the weekends. Those with little experience of hiking will find some fairly straightforward trails, passing Heungguksa and the Jang-am subway train station. Suwon stands just 30 km / 19 miles to the south of Seoul, where it is generally considered to be a satellite city and connected by regular subway and commuter trains. There are a few attractions within Suwon that serve as major draw cards, with the World Heritage Site of Hwaseong Fortress being amongst the most notable and dating back to the latter part of the 18th century. For the best views of Suwon, head to Gwanggyosan Mountain, while for a little peace and quiet, Manseok Park (Jangan-gu) is on hand and comes complete with a large lake. 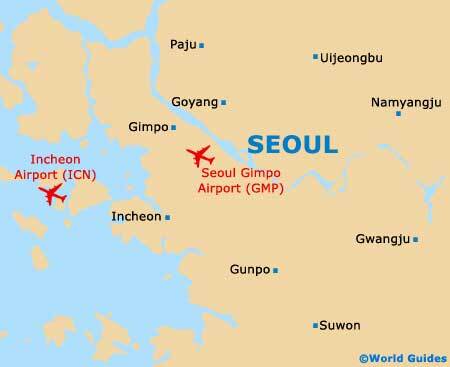 Sited directly to the west of both Incheon and Seoul, Yeongjong Island is actually where the city's international airport has been built, using reclaimed land. Day trippers come to Yeongjong Island for its sunny beaches, legendary hot spring and lively fish markets. Eulwangni Beach serves as one of the island's main coastal attractions, since many of the other beaches tend to feature large muddy flats at the time of low tide. If you are on Yeongjong Island at the weekend, then hang around for the evening fireworks on Eulwangni Beach.